Contact: Michael Ellis, M-NCPPC | Michael.Ellis@pgparks.com | Written by Kerrie Kyde. The distinctive inflorescence of Chinese silver grass. Photo by James H. Miller, USDA Forest Service, Bugwood.org. ANNAPOLIS, MD (November 1, 2017) – Tall silver and white and even purple plumes of grass nodding from old fields and road edges may catch your eye as they are tossed by autumn winds. Graceful and attractive in gardens, some ornamental grasses are rapidly becoming natural area problems. One of these is Chinese silvergrass, Miscanthus sinensis, also called maiden grass or Eulalia. 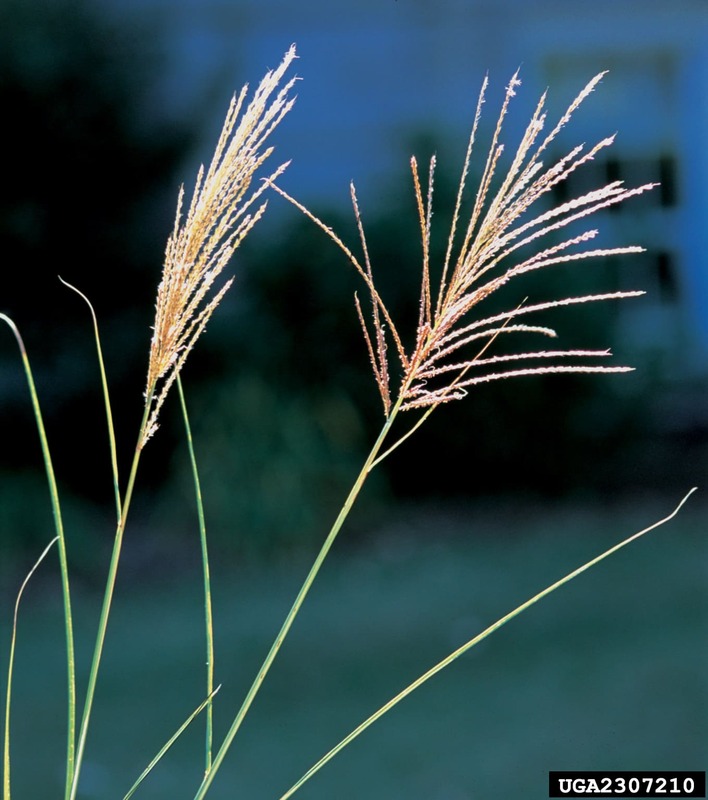 This perennial warm season clumping grass holds its feathery seed heads well into fall, and is particularly noticeable in the landscape as trees lose their foliage. Because the plants are so recognizable now, the Maryland Invasive Species Council has chosen Chinese silvergrass as its November Invader of the Month. The genus Miscanthus has about 25 species, but M. sinensis, and its more than 100 cultivated varieties, is one of the most popular for ornamental planting, and so, more available to escape cultivation. Chinese silvergrass grows in dense clumps from short branching rhizomes, and spreads out in concentric bands from an initial plant. It ranges from 3 feet tall to 10 feet, with long leaves crowded at the base. The leaves are green, about 1″ wide, with a distinct white midrib, and arch over at the upper ends, creating a cascading effect. Bloom stalks rise to the level of the foliage, or can tower above the foliage, depending on the cultivar. Panicles are fan-shaped to ovoid and dense, about a foot long, with more than 15 branches. Each inflorescence branch holds multiple vpairs of two-flowered spikelets. Each spikelet is tufted with fine hairs at its base that exceed the spikelet in length, giving the whole flower head a feathery, fine texture. The grass is wind-pollinated and seeds are wind-dispersed; the empty branches of the flower head often persist through the winter. Miscanthus sinensis invasion displacing rare and threatened species habitat in a sensitive conservation area. Photos by Michael Ellis, M-NCPPC. Chinese silvergrass is native to east Asia, from the Kuril Islands in eastern Russia, through Japan, Korea, and eastern China south to Taiwan. It grows in full to partial sun, in moist but not saturated soils and is adaptable to a wide soil pH range. The earliest known introduction to the US was from Japan in 1893, to Asheville NC, and then again in 1894, to Washington DC. Naturalized populations were reported from New York, Washington DC and Florida by the early 20th century, and in West Virginia by the 1940s. US naturalized populations are reported by EDDMapS from 27 states, from New York and Massachusetts south to Florida, and including Colorado and California. In its novel habitats, the plant typically occurs in anthropogenically disturbed areas such as open fields and road and railroad rights of way. However, there are documented occurrences, including in Maryland, of Miscanthus invading forest understories and edges. In its native habitat, Chinese silvergrass is used for roof thatching and as forage for livestock. In Kentucky, elk grazed on Miscanthus. Because of its fast growth, rhizome production and temperature adaptability, it is under consideration in the US as a biofuel feedstock. In one US study, it was found to compete successfully with native switchgrass, raising concerns about its ability to replace native grasses. There is little published evidence of impacts on natural areas in the US, but southeastern land managers list it as one of the plants they are most concerned about. The species’ reported growth and reproduction in high-canopy, relatively low light ecosystems, including in Maryland, is of concern, as the plant may move from disturbed edges into forests. Like many rhizomatous grasses, Miscanthus is difficult to eliminate by digging unless all of the root system is removed. Small pieces of rhizome can generate new plants. Repeated mowing during the summer growing season will ultimately kill the root system, in as few as two years, but cutting back old growth in the spring simply encourages new growth of the season. In Japan, conservation grazing by horses, cattle, and sheep has been an effective control. Burning, however, is not. Miscanthus responds vigorously to fire, and fire should be used only when followed by chemical application. Foliar application of 12″ tall newly emerged leaves, or cut and flushed grass clumps, with a glyphosate or imazapyr product in low concentrations will remove Chinese silvergrass. Grass selection herbicides such as Fusilade (active ingredient fluazifop-p-butyl) are also effective.